The first image of a black hole has been released and it matches precisely Einstein’s predictions of general relativity. Researchers during the press conference announcing the first image of a black hole. The image of M87–a black hole with 6.5 billion times the mass of the Sun–is remarkably close to the image built by scientists based on the principles laid down by Einstein. The future laid out by researchers is to attempt to capture a moving image of the black hole, to further confirm Einstein’s predictions. The researchers struggled to precisely nail down rotation–beyond saying it is rotating clockwise–and need to further review the data to ascertain the object’s magnetic field–if it possesses one. The sheer amount of effort that has gone into capturing the image of M87 is staggering. The Event Horizon Telescope (EHT) alone is a planet-scale array of eight ground-based radio telescopes forged through international collaboration and the image took 8 years of observations to capture. As such, now is an ideal time to review humanity’s history with the ‘black hole’ concept, as well as considering how such things are formed. In doing such we will journey through the minds of geniuses like Einstein, Newton, and Chandrasekhar observing early speculation, mathematical evidence and the death throes of objects billions of years old. 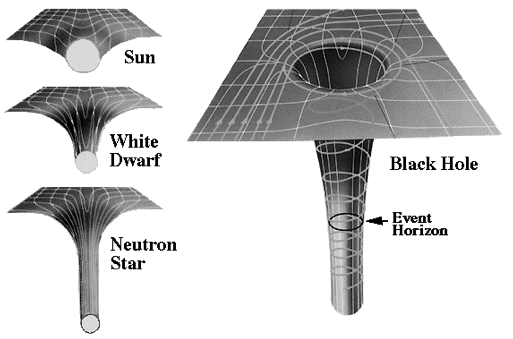 Before beginning our journey, it’s worth noting a general misconception about black holes. A black hole is not an ‘object’ like a star or planet. A black hole is actually a spacetime event. It’s a warping of the four-dimensional spacetime, a concept pioneered by Herman Minkowski and ceased upon by Einstein in the formulation of both special and general relativity. This idea isn’t just central to relativity. It’s fundamental to the idea of what a black hole actually is and the effect they have on the Universe around them. And when it comes to black holes, that effect is spectacular. The most common analogy is that of placing objects on a stretched rubber sheet. The larger the object the deeper the ‘dent’ and the more extreme the curvature it creates. In our analogy, a planet may be a marble, a star an apple. A black hole would be a cannonball. The most important aspect of the black hole is the event horizon — the boundary of the spacetime distortion from which there is no return. This light capturing, one-way-surface will be vital in our discussions. despite the various news reports of the first image of a ‘black hole’ — what the Event Horizon Telescope will be taking an image of is the event horizon. This closed surface where our understanding of the Universe and its laws collapses. But before we get to the introduction of black holes via the mathematics of general relativity, we will probe the first early speculations on the topic. Though the term ‘black hole’ was only coined in the 1960s, speculation about objects with the properties now associated with then arose much earlier. Before even the development of general relativity in 1916, Newtonian gravity had created speculation around the idea of a ‘dark star’ — a body so dense that not even light would have the required velocity to escape it. If we have a spherical body of mass M and radius R then according to the equations of Newtonian mechanics a projectile of mass m would need kinetic energy equal to the gravitational potential energy given by GMm/R where G is Newton’s gravitational constant. This energy is going to have to come from the particle’s velocity (v.es) at the time of launch. For a planet like Earth, that means a pretty mundane escape velocity — astronomically speaking — as Earth’s mass isn’t too big and its radius isn’t small. That’s about 12 kilometres per second. But this idea led early scientists to speculate — could there be an object so massive with such a small radius that not even light had the sufficient velocity to escape its gravitational effect? That would be a body with a radius of less than 2GM/c². Such a body, John Michell and Pierre-Simon Laplace suggested independently in the 18th century, would effectively trap light and would, therefore, be completely dark. in all honesty, these things have little to do with the black holes as conceived of in general relativity, but the concepts are extremely similar. That leaves us to ask: what was it about general relativity that first suggested the existence of black holes? Shortly after Einstein introduced his field tensors which laid the groundwork for general relativity — the geometric theory of gravity — he was stunned when someone was able to come up with a solution to these incredibly complex equations in short order. The man responsible for this solution was astrophysicist Karl Schwarzschild — who was, quite remarkably, serving on the Eastern Front in the First World War when he made his 1916 discovery. The Schwartzchild solution, as it became known, described the spacetime geometry of an empty region of space. 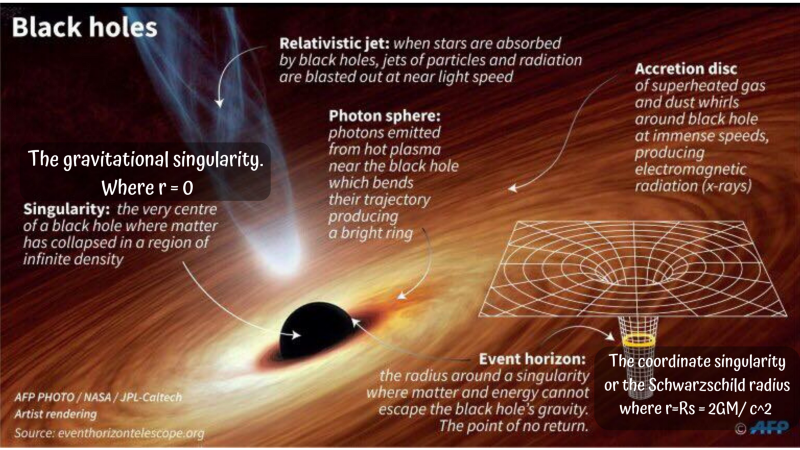 It had two interesting features — two singularities — one a coordinate singularity the other, a gravitational singularity. Both take on significance in the study of black holes. The coordinate singularity at r=Rs = 2GM/c² — referred to as the Schwarzschild radius (Rs) — normally falls well within the radius (r) of an astronomical body. So, taking the Sun as an example, Rs occurs at about 3km compared to an overall radius of 0.7 million km. 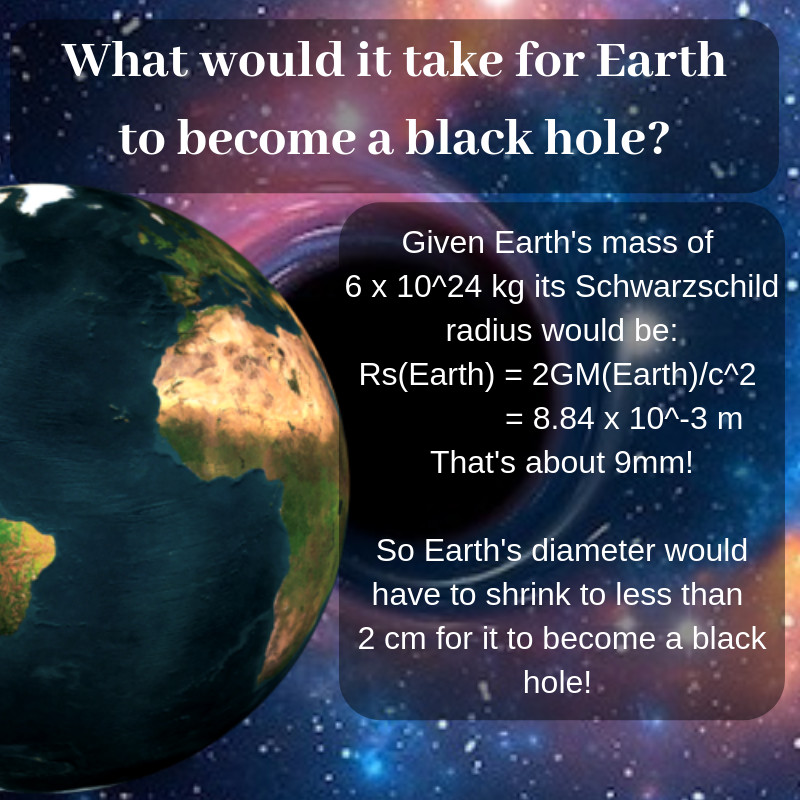 In a simple black hole, the Schwarzschild radius Rs marks the location of the event horizon — thus, it’s the point at which events that can be seen by distant observers and events which can never be seen, are separated. No signal can pass the event horizon as no light can escape it. Where Rs takes on special meaning is in cases where the opposite is true. What happens for a body that has a radius within this Schwarzschild radius, (ie. Rs >r)? When a body shrinks within this limit, it becomes a black hole. But how could that even happen? The equations of general relativity open the possibility that a body may undergo a complete gravitational collapse — shrinking to a point of almost infinite density — and become a black hole. In order for this to happen, however, a series of limits would have to be reached and exceeded. For example, planets are unable to undergo this gravitational collapse as the electromagnetic repulsion between atoms is strong enough to grant them stability. What about a more massive object like a star? Normal stars, such as the Sun, should also be resistant to gravitational collapse, partially due to the fact that the plasma at the centre of stars in this mass range is believed to be roughly ten times the density of lead. Even if this were not the case, the thermal pressure arising from nuclear processes and radiation pressure would be sufficient to guarantee a star of low to intermediate mass from collapse. But what about older, more evolved stars in which nuclear reactions have ceased due to a lack of fuel? It was suggested as early as the 1920s that small, dense stars — white dwarf stars — were supported against collapse by phenomena arising from quantum mechanics called degeneracy. This ‘degeneracy pressure’ is a factor of the Pauli exclusion principle, which states that fermions such as electrons are forbidden from occupying the same ‘quantum states’. This led a physicist called Subrahmanyan Chandrasekhar to question if there was an upper limit to this protection. Chandrasekhar proposed in 1931 that above 1.4 times the mass of the Sun, a white dwarf would no longer be protected from gravitational collapse by degeneracy pressure. Past this limit — unsurprisingly termed the Chandrasekhar limit — gravity overwhelms the Pauli exclusion principle and gravitational collapse continues unabated. These neutron stars would also be protected against gravitational collapse by degeneracy pressure — this time provided by this neutron fluid. In addition to this, the greater mass of the neutron in comparison to the electron would allow neutron stars to reach a greater density before undergoing collapse. To put this into perspective, a white dwarf with the mass of the Sun would be expected to have a millionth of our star’s volume — giving it a radius of 5000km roughly that of the Earth. A neutron star of a similar mass though, that would have a radius of about 20km — roughly the size of a city. By 1939, Robert Oppenheimer had calculated that the mass-limit for neutron stars would be roughly 3 times the mass of the Sun. Above that limit — again, gravitational collapse wins. Oppenheimer also used general relativity to describe how this collapse to appear to a distant observer. They would consider the collapse to take an infinitely long time, the process appearing to slow and freeze as the star’s surface shrinks towards the Schwarzschild radius. An observer falling with the surface, though, they would notice nothing. The passing of Rs would just seem a natural part of the fall to them despite it marking the point of no return. To the distant observer… the surface would freeze and become redder and redder thanks to the phenomena of gravitational redshift — also the reason the event horizon is sometimes referred to as the surface of infinite red-shift. This is the birth of the true black hole concept. But theory isn’t quite ready to hand black holes over to practical observations just yet. The field equations of general relativity also allow us to categorise these spacetime events. There are at least two separate ways to classify black holes — this is due to the fact that they have relatively few independent qualities. 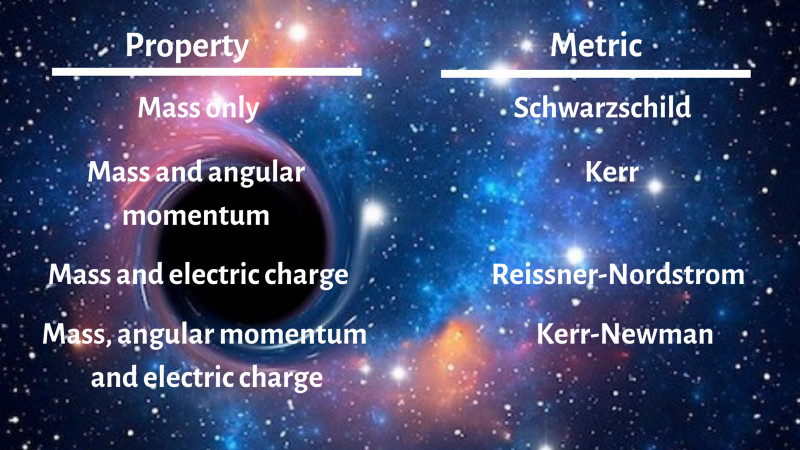 In fact, they have only three independent measurable properties — mass, angular momentum and electric charge. All black holes must have mass, so this means there are only four different types of black hole based on these qualities. Each is defined by the metric used to describe it. 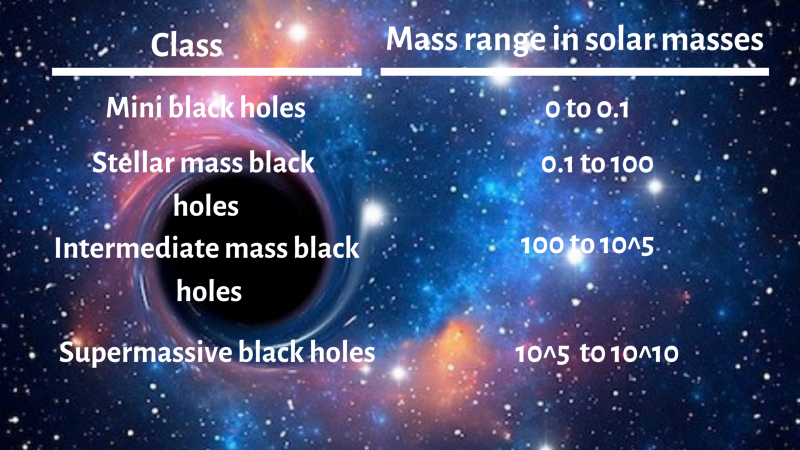 A second — perhaps more widely used — classification scheme for black holes is based on their mass. These mass classes are perfectly defined and different sources have different ideas. Below is a rough idea. 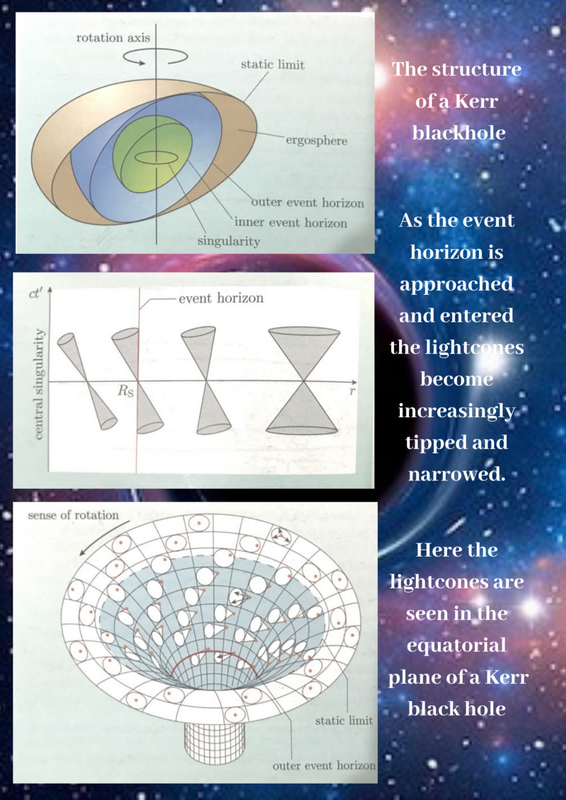 As most black holes are considered to be rotating and non-charged, when considering the composition of a black hole it’s worth examining Kerr black holes. The interesting thing that arises from the mathematics that comprises the Kerr metric that describes a rotating, non-charged black hole is that the terms in the line element suggest that a black hole’s angular momentum drags spacetime along with it. This is just one reason why the environment by a black hole is so violent. Any matter than enters this region is churned violently. Cosmologists call this effect — the skewering of spacetime — frame dragging. 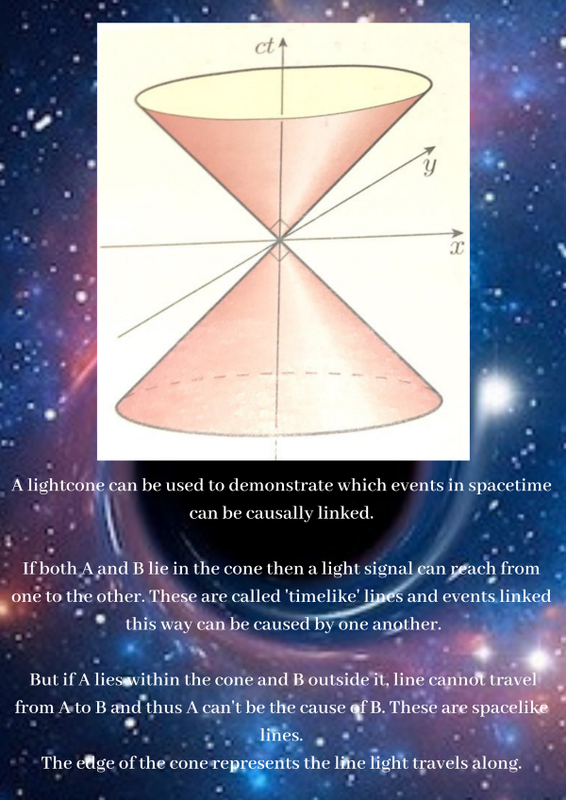 It can be seen more clearly in its effect on a tool physicist use called a ‘lightcone’. All fine and good, but what does this ‘tipping of lightcones’ actually mean? What’s the physical significance? Far from the black hole, light is free to travel with equal ease in any direction. The lightcones here have a traditionally symmetrical appearance that represents this. Towards the static limit, the lightcones begin to tip towards the singularity and in the direction of rotation and narrow. The static limit represents the point at which light is no longer free to travel in any direction. It must in a direction that doesn’t oppose the rotation of the black hole. Nor can particles sit still at this point — hence the name static limit. The dragging effect is so strong, not even light can resist it. Signals can escape this region — it isn’t the event horizon — but they can only do so by travelling in the direction of the rotation. Interestingly, physicist, Sir Roger Penrose, suggests that particles entering the static limit and decaying to two separate particles may result in energy leaching from the black hole in what in known as the Penrose process. Having looked at the anatomy of a black hole, event horizons and static limits theory can now tell us the effect a black hole could have on an astronaut unfortunate enough to fall into one. Anyone falling into a black hole is guaranteed to be crushed to death upon reaching its central gravitational singularity, but the journey may spell doom even before this point has been reached. This neglects the tidal effects of the black’s immense gravity. Of course, tides are a familiar concept on Earth. They arise from the variations in the gravitational field of the Moon and the Sun across the diameter of our planet. 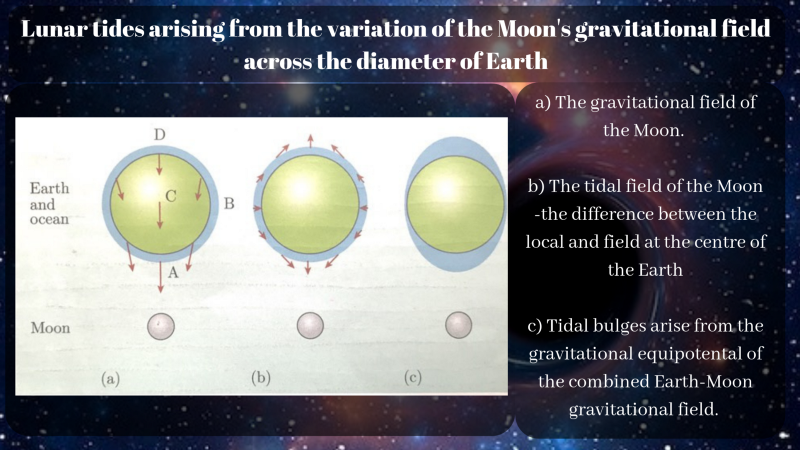 The effect of this tidal field is clearly to redistribute the oceans — forming what is called an equipotential surface for the combined Earth-Moon gravitational field. The mathematics of general relativity explains this surface as a geodesic deviation — a geodesic being a straight line across a curved surface. On a flat surface, a geodesic would be… well, a straight line. For out clumsy astronaut falling towards a black hole — the result of geodesic deviation is catastrophic. 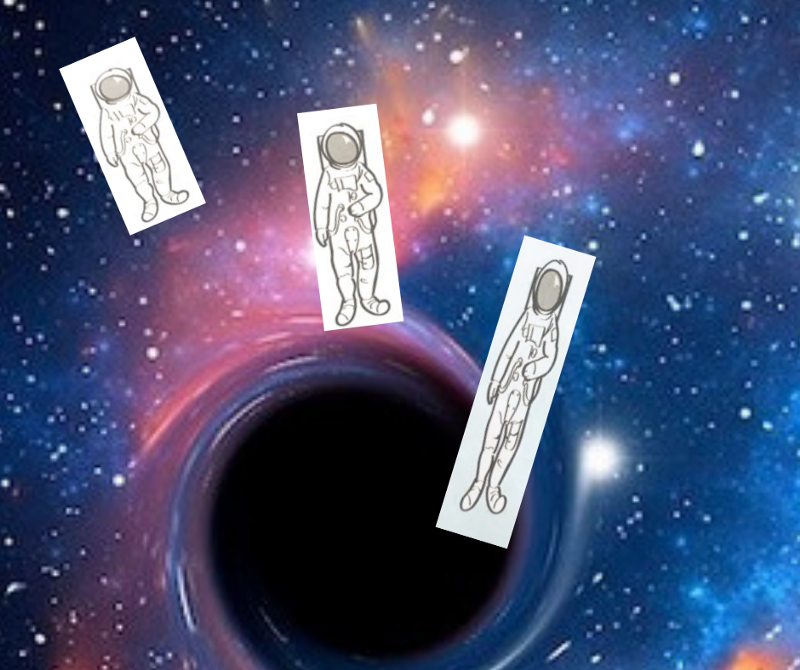 As the astronaut’s centre of mass falls towards the black hole, the object’s effect on spacetime around it causes his head and feet to arrive at significantly different times. This is because during the fall the geodesic deviation stretches the astronaut in a radial direction whilst simultaneously compressing her in the transverse direction — a process physicists have termed spaghettification. This is an actual physical event — not an illusion caused by the light capturing powers of the event horizon. A clumsy astronaut loses her footing and tumbles toward a black hole — being spaghettified along the way. For a stellar-mass black hole, this process would occur well before our astronaut reaches the event horizon. For a black hole 40 times the mass of our Sun — spaghettification would occur at about 1000 km from the event horizon, which is, itself, 120 km from the central gravitational singularity. What I’ve laid out thus far marks such a remarkable achievement in the advancement of human knowledge. The most startling thing about all this, though, it all came to us before we even knew black holes existed. These revelations came purely from the mathematics of general relativity. It’s easy to see why Einstein is regarded as a genius, though he was hardly the only person deserving of such acclaim involved in this story. That fact that we knew all this before making an observation of the skies just makes the image of a black hole and it’s surrounding environment tha–revealed on Wednesday, April 10th– that much more momentous. Of course, it also hints at the next stage of our understanding of black holes. How exactly, if light cannot escape them, did we discover that they exist at all, and at the centre of every galaxy no less! That is a discussion for another time. Relativity, Gravitation and Cosmology, Robert J. Lambourne, Cambridge Press, 2010. Relativity, Gravitation and Cosmology: A basic introduction, Ta-Pei Cheng, Oxford University Press, 2005. Extreme Environment Astrophysics, Ulrich Kolb, Cambridge Press, 2010. Stellar Evolution and Nucleosynthesis, Sean G. Ryan, Andrew J. Norton, Cambridge Press, 2010. Cosmology, Matts Roos, Wiley Publishing, 2003.